The Australian Public Intellectual Network have released their list of theÂ top 40 Australian Public Intellectuals, and yet again I have bewilderingly been overlooked. I was probably number 41, so if I was Glyn Davis, I’d be watching my back. I’m putting the final touches on an exhibition of gag cartoons at the Sidespace (very likely opening tomorrow if I can get everything sorted) and dug this cartoon out of the depths of a deceased laptop’s hard drive. So there, I’ve mentioned the exhibition, so I’d better get on with it. 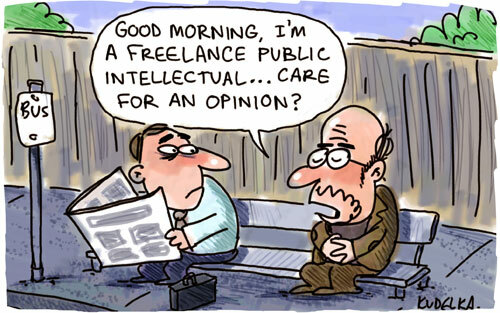 Stupid top 40 Australian Public Intellectuals. It’s because I don’t wear skivvies you know.